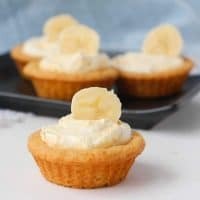 Moist, creamy, and delicious banana cream cookie cups are easy to make with sugar cookie dough and banana pudding mix. Even the little ones can get in the kitchen and help make these easy and delicious treats! Do you love quick and easy dessert recipes? If so, you are in luck because they don't get much easier than this. This banana cream cookie cup recipe so simple, yet so delicious. The combo of the creamy banana pudding and the sugar cookie cups is just amazing! 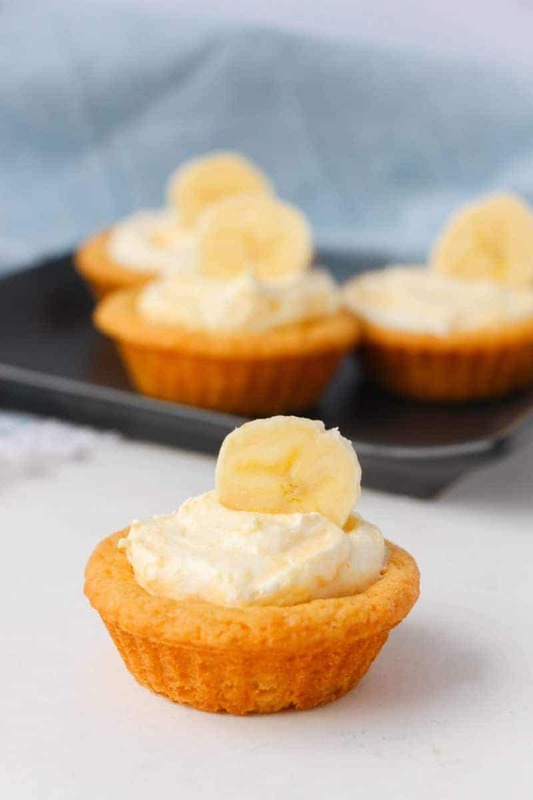 These banana pudding cookie cups would be perfect for any potluck. They are a tasty dessert that your family and friends are going to adore. With only five ingredients, you're going to want to make these easy cookie cups over and over again. What's so great about this recipe is that it begins with sugar cookie dough and banana pudding mix. This makes the recipe super simple. However, if you would rather make the sugar cookie dough from scratch, there's a recipe below for that as well. This is the type of recipe that kids can help prepare. If you want to get in the kitchen with the kids, this is the perfect recipe. There's really nothing in this recipe that kids couldn't help with. If you have small kids, the only thing they can't do is take the cups in and out of the oven. 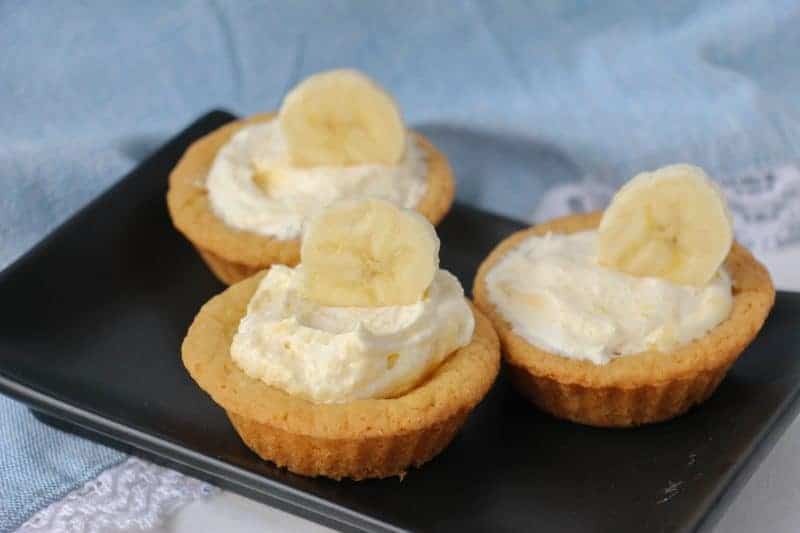 One last great thing about these banana cream cookie cups is that you can make these your own. Don't like banana, use chocolate pudding or any other flavor. You could even switch out the cookie dough. Try using peanut butter cookie dough with chocolate pudding. Just have fun with it. If you're looking for a quick and easy recipe that can be made with thousands of different flavor combinations, you are going to have a lot of fun with these cookie cups! 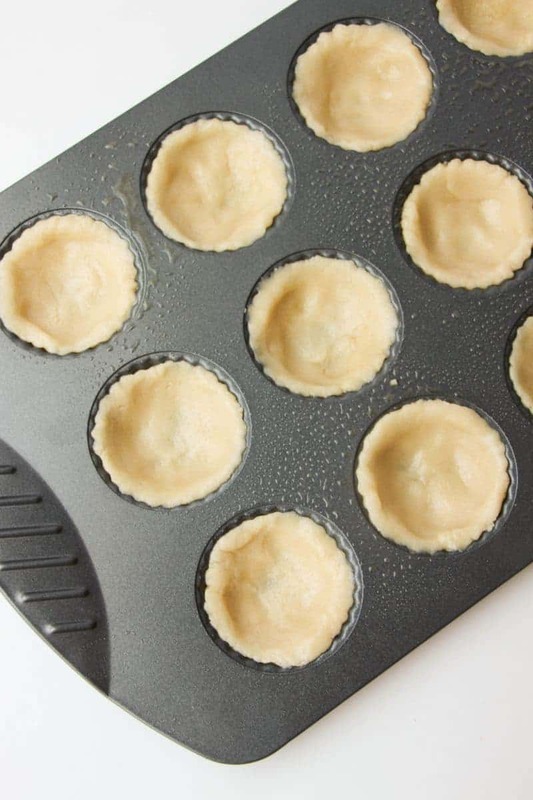 Grease a muffin or tart tin and press 1-2 Tablespoons of cookie dough into each indentation and press to shape into a cup shape (along the bottom and sides of the indentation). When each muffin tin is full, bake the cookie cups for 8-12 minutes (will vary depending on the size of your tin). Allow the cookie cups to cool in the muffin tray before removing. 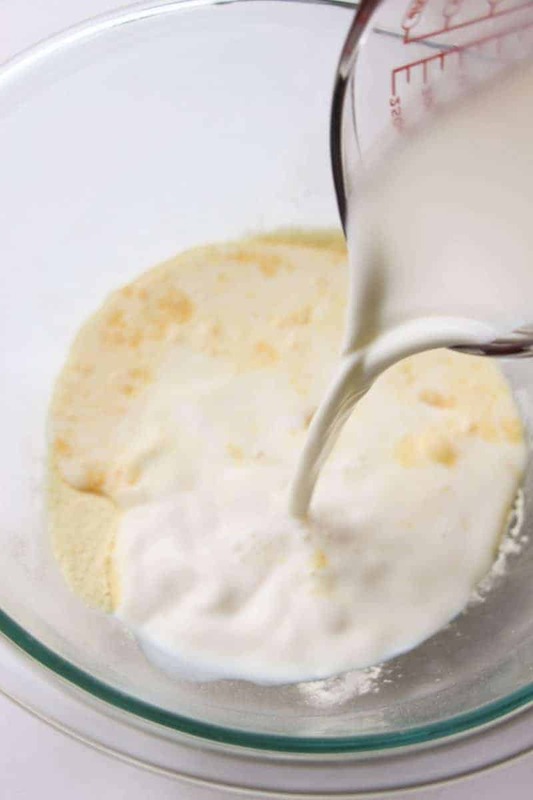 Then, for the banana pudding filling, use a hand mixer to combine the banana pudding mix and milk until starting to thicken, about 2 minutes. Next, fold in the whipped cream topping and be careful not to overmix. Finally, spoon 1-2 Tablespoons of the banana cream filling into the cookie cups and top with banana slices and sprinkles, if desired. 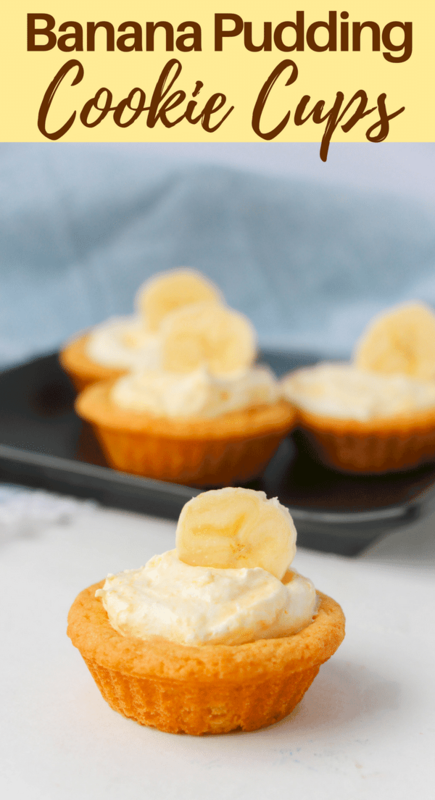 I hope you and your family enjoy these delicious banana pudding cookie cups! 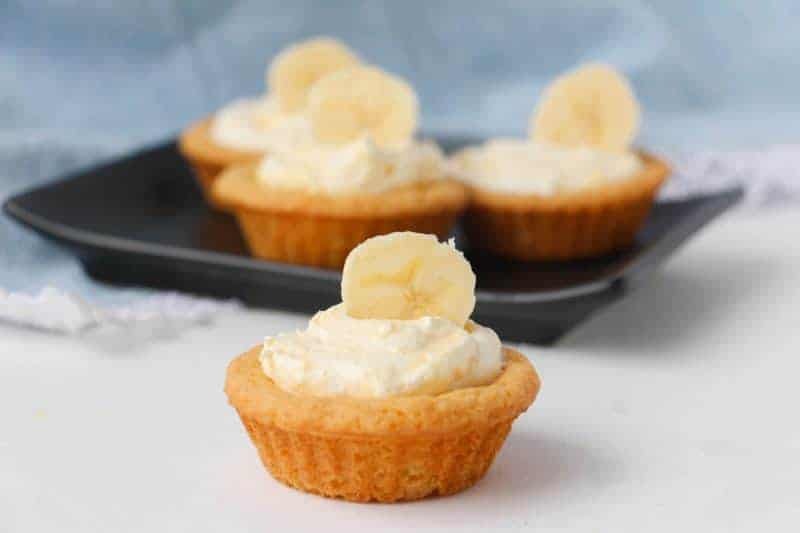 Moist, creamy, and delicious banana cream cookie cups are easy to make with sugar cookie dough and banana pudding mix. Cream the butter and sugar together with a mixer until light and fluffy, about 2 minutes. Add in the eggs and vanilla. In a separate bowl, stir together the flour and baking powder and then slowly add it to the sugar-butter mixture. Once all of the flour is incorporated into the dough, form into a ball and cover with plastic wrap. Refrigerate for 30 minutes before shaping into cookie cups. 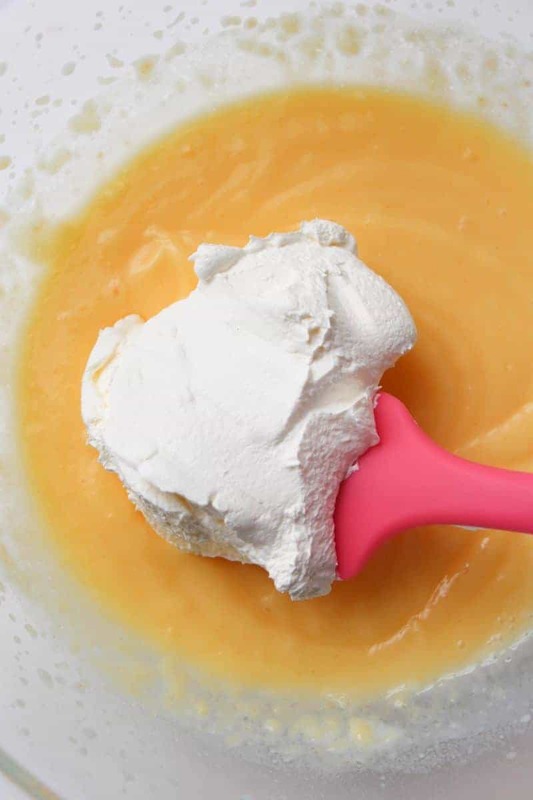 For the banana pudding filling, use a hand mixer to combine the banana pudding mix and milk until starting to thicken, about 2 minutes. Fold in the whipped cream topping and be careful not to overmix. 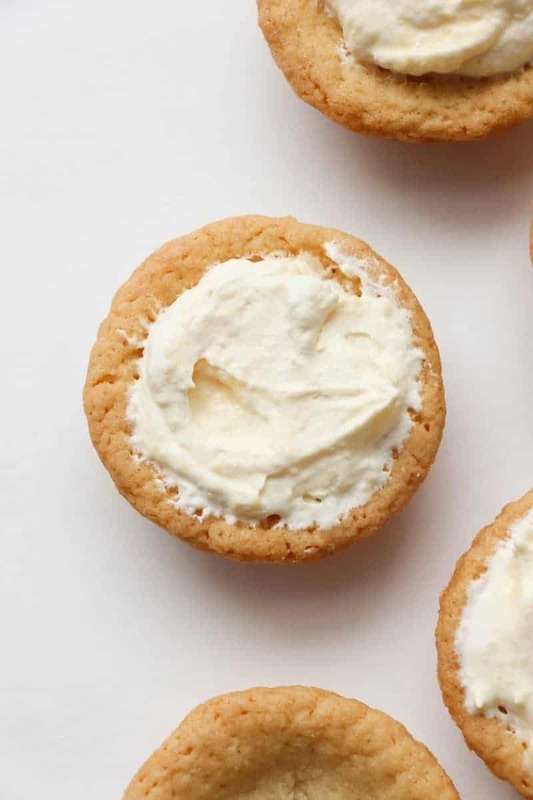 Spoon 1-2 Tablespoons of the banana cream filling into the cookie cups and top as desired. This is so easy, and looks delish, it is a great “semi-homemade” recipe I’d love to try for company with kids. I am so into baking right now. I am definitely going to try this one out! Hopefully, it will come out successful as my previous trials of cookie recipes failed. This sounds amazing! I will definitely be making this on the weekend! These look super delicious and very easy to make, my guys would love them. These look delicious! I have saved this recipe! Yum! We are always looking for different treats to prepare the grand kids…and me! These turned out yummy!! Thank you! OMG. . .so easy and so tasty!!! I piped the filling with a large star tip and sprinkled with crushed graham cracker crumbs. Huge hit at a work event!!!!! This is a fairly simple,yet really clever and yummy recipe. I made these again a few days ago and they didn’t last very long. What a super delicious dessert! And so fun too! These will be a big dessert hit! We love the smaller desserts. Using the cookie dough to make a crust is a great idea! Such a great idea – my kids will love these! The bananas on top make them look even more special – so cute! Quick and easy desserts are always great to have on hand. These look so cute! Yum! Those look so delicious! My family will love these! I love the presentation, as well!